Metal conditioner is designed for creating special operating conditions for automatic transmission and steering booster units and mechanisms, under which high-efficient multilevel system for protection against wear and overloads is formed. Metal conditioner is formulated on basis of full synthetic polyatomic polymer and a special balanced package of antioxidant, extreme pressure and detergent additives. Due to the covalent atomic bond polymer molecules are very stable to deconstructive influence of local overloads in the friction area. It allows avoiding contact “METAL – METAL” in the friction area for the whole life span of the fluid. extend life span of automatic transmission by 4 times! improve the accuracy of the steering booster operation. 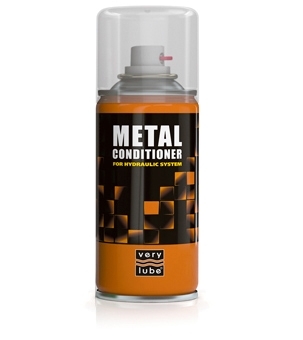 Add Metal conditioner into hydraulic fluid, it will serve you the whole life span of the fluid. Spray the content through the nozzle into the oil filler neck of automatic transmission or steering booster. 150 ml (1 can) per 8 L of hydraulic fluid. 20 ml per 1 L of the fluid (spray during 15-20 sec). Run the car in a regular operating mode without any restrictions. Use the product every time you change hydraulic fluid in automatic transmission, steering booster. Does not contain fluoropolymers, graphite, ferrous and non-ferrous metals, ceramics, esters. Safe for all types of structural materials, applied to hydraulic systems of automatic transmissions and steering booster. Neutral to plastic, rubber and paper. Nontoxic and not flammable. The product is compatible with any kind of automotive fluids for automatic transmissions and steering booster, does not change their viscosity and frictional characteristics.